BinaryOptionsNow – MarketsPulse offers high-quality online trading technology to binary options brokers. The company’s technological solutions are top-notch allowing online traders to experience some of the best services available in the binary options market. The MarketsPulse platform is made up of three parts each one of them with its own distinct features. The first part of the platform is the MarketsPulse Back Office that offers binary options brokers advanced management tools. The Back Office will allow administrators and binary options brokers to control all the aspects of their system such as assets, options schedules and more. It also contains a useful interface that gives a detailed overview regarding all the activity on the site. The second part of the platform is the MarketsPulse Core that operates in the background and executes all the operations of the broker. 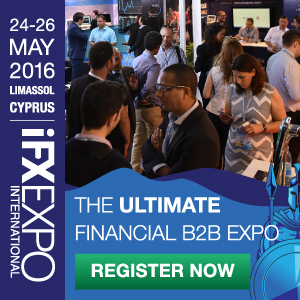 It also allows brokers to create and schedule derivatives, send live feeds to clients. This platform segment also saves all trading information for further reference. The last part of the platform is the Trading Web Site. This is the only platform that offers real and unique trading websites to online brokers. These websites can be customizes according to the broker’s preferences. This refers as much to the features available as well as to the visual aspects of these websites. The reason why we believe MarketsPulse is a top of the line binary trading platform is because the visual aspects of the service are extremely elegant and modern. A large number of binary options brokers use the software and platforms developed by larger companies some of them don’t live up to modern standards – Tradologic’s platforms in particular. This is all different with the MarketsPulse interface that will allow new traders to quickly learn every aspect of the services provided. This is aided by the fact that everything from menus to graphs has been individually crafted with the user and trader in mind. Other platforms that also provide a large variety of features for some reason don’t always manage to structure everything in the way the MarketsPulse platform does. Another great aspect of the platform is that it is highly customizable by both the broker and the user. The broker will be able to include only those features that it thinks will be needed by the trader. The trader will also be able to only select the features and graphs that he or she believes are necessary. The graphs generated by the platform are vivid and colorful while at the same time retaining the simplicity and elegance of the overall platform. Different colors will aid traders’ eyes to find all the relevant information in the shortest possible time. 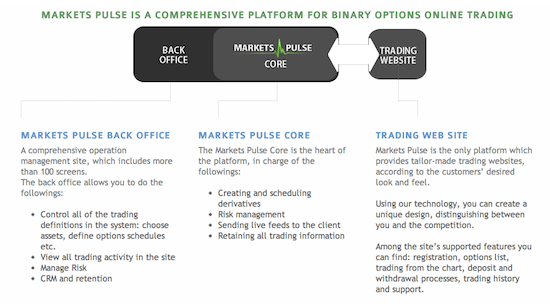 The MarketsPulse binary options platform provided top-notch security that protects the private details and information related to traders and their accounts. It can also be installed very easily to any online broker which allows the commencing of operations within the shortest possible time. The binary platform is also developed in the way to be fully compatible with various different languages. Brokers will easily be able to add new languages to the platform depending on their target markets and trader bases. The platform also allows the implementation of features with regional differences, so it goes way beyond just regular translations. The software platform is also developed in order to be usable by both large and small binary options brokers. Depending on the daily trade traffic brokers will be able to choose which features they would like to use in order to meet the demands of their clients. While being a top binary options platform, the MarketsPulse platform still lacks some advanced features that would be welcomed by experienced binary options traders. As a further improvement the creators of the platform could implement new features that specially target high-volume and experienced traders. 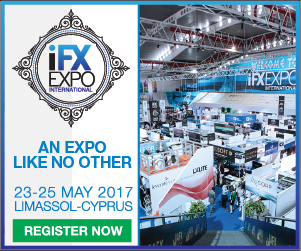 All in all the MarketsPulse platform offers very good services and features that will be welcomed by almost all binary options brokers. At this moment the MarketsPulse platform is employed by a significant number of brokers such as Leverate, I am FX and Gallant Capital Markets and Opteck.